The State Department announced a new $600,000 taxpayer-funded study that suggests "ideals of masculinity" in Kenya are contributing to terrorism. The department's Bureau of Counterterrorism is seeking a nonprofit group to "explore gender identities of boys and men in Kenya." The grant proposal states that men being "tough, heterosexual, aggressive, unemotional, and achieving" can make them vulnerable to joining Islamic extremist groups. "Gender is increasingly recognized as an essential aspect to understanding and countering violent extremism throughout the world," the State Department said. "To date, research and interventions on gender in Kenya have predominantly focused on the role of women and girls in violent extremism. However, men and boys are disproportionately recruited by and join terrorist groups and carry out terrorist operations. In Kenya, there currently exists no CVE [countering violent extremism] programming dedicated to the role of gender of boys and men and vulnerability to violent extremism." To remedy this, the State Department will spend up to $592,500 on the "Masculinity and Violent Extremism" study, which will be awarded to an American nonprofit or nongovernmental organization later this year. The study will "determine existing knowledge and gaps on male gender and violent extremism as well as explore gender identities of boys and men in Kenya." The grant proposal blames Kenya's "patriarchal" society of "tough, heterosexual" men for problems facing the developing country. "In Kenya, boys and men are disproportionately recruited by al-Shabaab and more likely to be both operators and victims of terrorist acts," the State Department said. "Kenyan society, while diverse in its ethnic and cultural composition, is uniformly patriarchal and highly prescriptive of gender expressions and identities." "Kenyan males are expected to head the household as well as provide for, protect, and maintain the family," the department continued. "Socially, males are expected to be tough, heterosexual, aggressive, unemotional, and achieving. The practical and social pressures to fulfill these expectations can be immense and create vulnerabilities that are exploited by violent extremist groups who appeal to these characteristics and offer the opportunity to fulfil [sic] these roles." 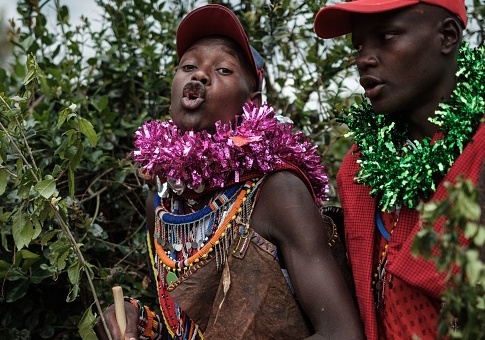 The State Department added that the research would involve fathers and community leaders in Kenya in the hopes to "shape existing cultural narratives on masculinity, gender, and violent extremism." "Funds will support male-to-male dialogue and training on issues of gender and encourage stronger social and familial support structures," the department said. This entry was posted in Issues and tagged Government Spending, Kenya, State Department, Terrorism. Bookmark the permalink.